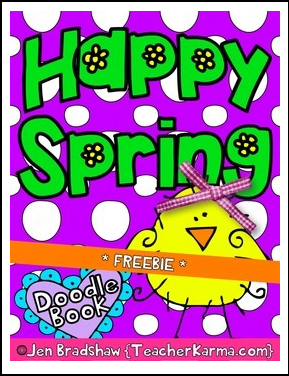 The FREEBIE Spring & Easter Doodle Coloring pages were designed to help keep your students engaged before and during the Spring holidays. This Spring Doodle FREEBIE is part of a full-product download. Please click on the link below or keep reading to find out more. This doodle book comes with a special cover so teachers can give it as a Spring or Easter gift to students. 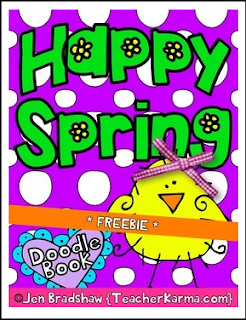 Spring doodles are also great for art teachers and homeschool classrooms. • The very detailed handouts will provide your students with engaging doodles to color. • While students are staying engaged, behavior will be less of a problem...you know how it gets...close to the holidays. • Improve hand / eye coordination while having fun at the same time. EVEN BIG KIDS LOVE THESE DOODLE COLORING PAGES!!! **I LOVE giving this doodle book as an Easter gift! Just print it out and add the special, "Happy Easter from your teacher" doodle coloring book cover to the front. Thank you for visiting Teacher Karma. If you have any questions or concerns about a product, please feel free to email me. Teaching happiness in elementary school? FREE MISC LESSON - MLK Jr Reading Freebie!